So You Want To Be a Public Speaker? Develop your Competencies in 3 Core Areas: Knowledge, Ability and Skill. As he said those words, he pointed directly at me. I looked behind me, around me and then froze. He looked steadily at me and said, “yes, I am talking to you!” I was sixteen at a large youth camp gathering in North Carolina, when this prominent speaker, singled me out in a crowd of more than 400 teenagers and told me I would one day speak in front of large crowds all over the world. Rather than getting excited, like a normal teenager, I was upset, because my parents were both public figures in our community, I had zero interest in pursuing pastoring as a career path nor did I aspire to be in professions that would put me in the public eye. As such, I did what any indifferent teeanger would do, commit herself to ignoring whatever some random stranger told her, in front of hundreds of people. So I spent the next 18 years successfully shrinking myself and diminishing my own light because I did not want the responsibility that came with being in the public eye. I shut it down and locked it out of my memory for 1.5 decades and it worked. While I am not at all shy, I don’t particularly like drawing attention to myself unless I have something meaningful to share or a useful question to ask. As a professional advisor, you ask more questions than you speak. One of the keys to being a good consultant is learning how to listen and read between the lines to solve complex problems and not incessantly talking your client’s ears off. However, not long after starting my independent consulting/coaching practice, it became clear to me that public speaking is the most effective tool to keep my business going, I didn’t have a choice but to pick up the Mic! Long story short, 2018 was the year I would take on more speaking engagements and it was more out of necessity than the desire to get on a stage. 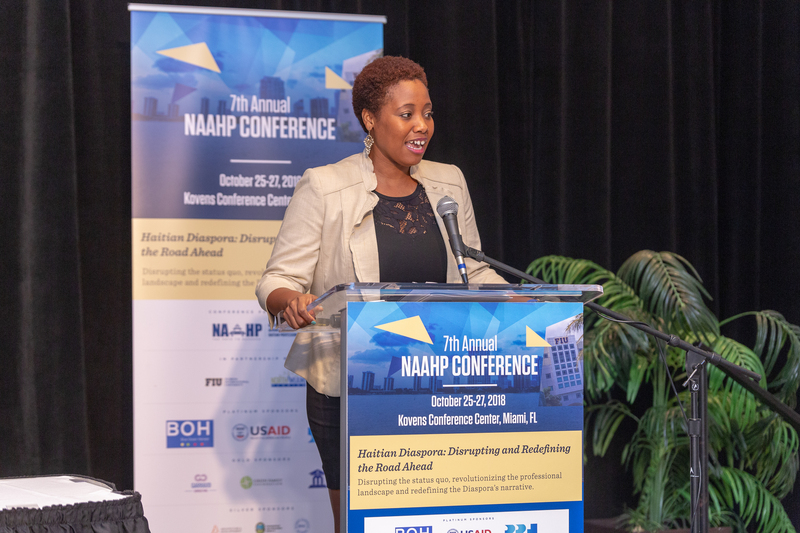 This past year, I was invited to speak at about 25 events, ranging from delivering keynotes at the NAAHP Conference in Miami, being on panels such as Wonder Woman Tech in Long Beach and Forward Cities and Hacking HR Forum to delivering workshops at Women International Networking in Rome. While I had to decline many more invitations than I was able to accept, I learned quite a few things along the way that might be useful to anyone who would like to do more public speaking in the future. Competency 1: Knowledge – Be genuinely curious about the world around you, be passionate about an idea and cultivate an inquisitive mindset. Read the classics, particularly books across disciplines, fiction, and nonfiction that discusses timeless ideas and first principles about the human condition. When possible, go to the source. For example, don’t just expose yourself to self-help books, go directly to whoever came up with the original idea. Almost everything else is derivative. Keep a journal and make the time to stay informed about social, political, economic and cultural issues. I recently discovered that I am a polymath, in layman’s term – a deep generalist across multiple disciplines – business|organizations, professional development, entrepreneurship, social issues, and public policy. This aspect of myself has been more useful to me as an independent professional advisor than when I worked for large corporations. Competency 2: Ability – Can you show up, time after time, take stock of your own performance and commit to improving your craft? Practicing what you “speak” or “walking the talk” is not often associated with public speaking because people may see speaking as either a form of entertainment, performance or salesmanship. However, depending on the audiences you engage, the more your “walk” varies from your “talk,” the more misaligned you will seem to the person with a spirit of discernment. Even though we now live in a world of alternative facts, integrity still matters as a professional. Be ready to take some risks and experiment and test ideas, knowing that some will fail. Many of the invitations I received were last minute and down to the wire. One of them was the night before the conference. At 10 pm the night before a conference of 400 funders, I began preparing thoughts for a public policy conference. Competency 3: Skill – Press play, pause and then repeat. While repetition and self-awareness are uncomfortable, they are necessary. Not clear of the nature of the panel, it quickly turned into multiple keynote presentations, I had to walk on that stage with increasing awareness that I had a picture in my mind that I had an audience of one. I tailored my thoughts accordingly. I found myself the first of four speakers and all subsequent speakers gave keynote-style presentations, while as the first speaker, I delivered a brief 3 min intro of myself. Needless to say, I kept my composure while fully aware that I was unprepared. I did the next best thing and as the last speaker to speak in closing, I weaved in the highlights of all the three other keynotes into my closing statement using my instincts and employing every public speaking tactic I’ve learned over the years to guide my delivery. I was only able to do this because I’ve had a lot of practice: as a speaker, a consultant and as an MBA student who often had to give technical presentations on topics foreign to me. Had I not practiced learning how to listen, organize my thoughts quickly and how to communicate for comprehension, it would have been disastrous. While developing your Knowledge, Ability and Skill is crucial to effective public speaking, in the final analysis, it is intangible traits such as empathy with the audience that allows us to listen through the quiet and connect through the word.